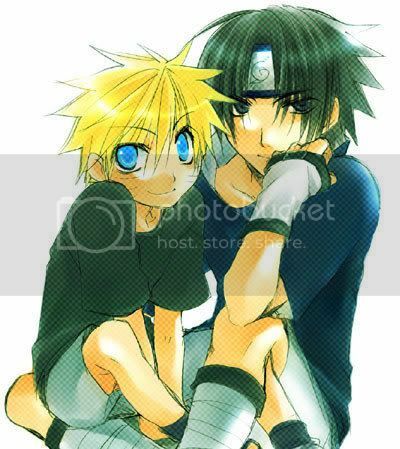 I love SasuNaru, my favorite pairing. I write fanfics and songfics. My writing has a lot of emotion. I wish to move to Japan. My favortie character is Sasuke. My favorite band is Evanescence. Two things I could talk about all day is Naruto and Evanescence. Mostly all my OC's are based off of friends, and most of the stories have to do with things going on between us. Summary: Naruto runs away after his third failed attempt at rescuing Sasuke. After Sasuke's willing return three years later...it's his turn to finally give Naruto something in return, he's going to bring him home. But will this bring joy or heartache? "I mean nothing to you." Summary: Naruto was a loud, obnoxious, hyper kid that no one liked. Now in 11th grade, everyone wonders what happened to him, over the summer something tragic happened to him, and now he doesnt talk to anyone except for Kiba. Sasuke comes to his school for 11th grade and quickly falls for the blonde. They become very close and he helps Naruto overcome his greatest fear, the dark. What happened to Naruto? And why is he scared of the dark? Summary: Sasuke and Naruto have been friends their whole lives. Naruto has been in love with Sasuke for 5 of those years. Now that Sasuke has a girlfriend and Naruto has a heartbreaking past, he'll do anything to make the pain go away. Summary: Naruto and Sasuke have loved each other their whole lives, but only one thing finally brought them together...cancer. Summary: Sasuke has loved Naruto for as long as he could remember, but denied it to himself. Now after the Valley in the End, Naruto hates Sasuke and Sasuke is left heartbroken, can he survive like this or will his suicidal tendencies lead him to death? Summary: Just an angsty poem about Naruto losing everyone. Summary: I was watching Trinity Blood one night, and got an awesome idea for a SasuNaru. The vampires and the Vatican are in a deep war. Naruto is young blonde boy who is reckless and despises the Vatican. Sasuke is his care taker and also the one he loves. The love each other dearly and want to protect one another. Will their love last this horrible war? Summary: Sasuke, Naruto and Sakura go on a mission in the Country of Snow. Naruto get's sick and Sasuke blames himself for failing his friend again after leaving him the last time. Sasuke noticing his feelings start to bloom for the blonde boy. While Naruto is fighting the fact that he has fallen in love with his best friend. Sasuke was a very troubled kid, he was abused by his parents, that are now in jail, and was sent from foster home to foster home and no one seemed to want him. He turned into an alcoholic. His best friend Gaara always stood by him and never left him, they were like brothers. Now that Sasuke needs another home, the Hokage has decided to ask a certain blonde shinobi to take Sasuke in. When Naruto agree's they start living together, Gaara comes over all the time, but when the dark haired boy find to be attracted to the blonde what will happen when he tell his new care taker his feelings for him?! Summary: Just a quick SasuNaru 4th of July fic. Hope you enjoy. HAPPY 4TH EVERYONE! Summary: I just listened to this song! And was on a sugar rush and decided to write a story about it. SasuNaru, Humor. Summary: What happens when forbidden love could end your life?